On the road and selling merchandise? Bored of selling t-shirts and hoodies? Why not try our concert scarves! 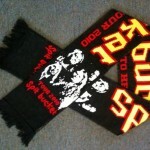 We can add your group’s logo and keep the theme of the scarf around the music you produce. Heavy rock to pop we have done them all. 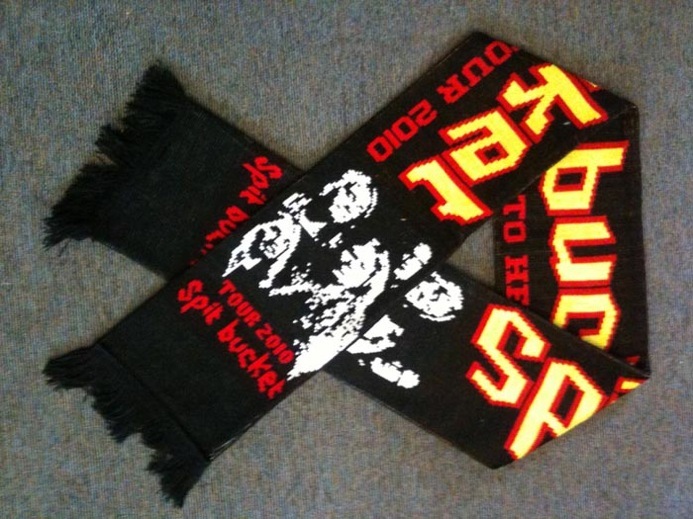 Foster Enterprises is the best place for official scarves for your band or group, working to your requests we can design a scarf of high quality that you will be proud to sell in your shop. Deadlines are not a problem we can work around you and a normal order takes approximately 10 – 15days to complete. Unlike other companies who order scarves from the eastern market we welcome you to visit are factory in Leeds to follow your order though the production stage. We use high quality ring spun acrylic yarn from Turkey; preferably one of the best counties that produces yarn, giving your scarf a double thermal knitted texture. Your own labels can be added if you have them already or for an extra cost we can produce them for you. Foster Enterprises’ design department is probably the most experienced in the manufacturing knitting sector with over 30 years of trading we have done everything from designing scarves and badges to sunshades. We offer free artwork design on every product so you will never have to pay for artwork. As well as scarves and clothing, we know how to reproduce complex graphics on small items such as badges, keyrings, tie slides, cufflinks and wristbands. No artwork charge or Set up Fee’s for jacquard scarves.